Mock-ups of the Hiroshima "Little Boy" uranium (gun-design) bomb and Nagasaki "Fat Man" plutonium (implosion) bomb, Los Alamos National Laboratory Museum. Author photo. At 8.15 a.m. on Aug. 6, 1945, a tiny amount of uranium-235, weighing no more than a single sheet of paper, transformed into energy above the city of Hiroshima, Japan. The resulting explosion was equivalent to 15,000 tons of TNT, causing about 60,000 immediate deaths and perhaps three times that number over the next few years. The arguments for and against the use of that bomb, and the one used against Nagasaki just three days later, have raged for decades and will probably continue. This column will focus on the design of the bomb itself. The Hiroshima bomb, code-named "Little Boy," weighed four tons and was 10 feet long (see photo). The twin hearts of the bomb were two assemblies of uranium-235 with a total weight of about 140 pounds. 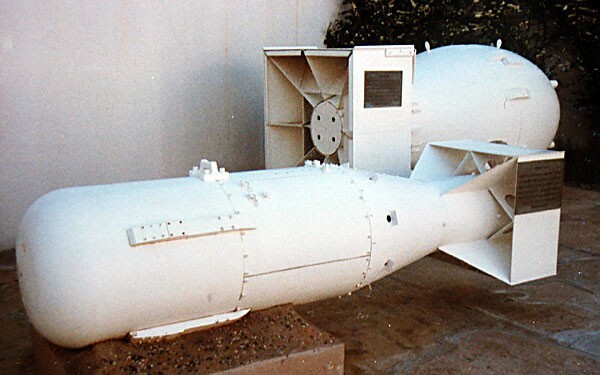 When one of the finely-machined assemblies was shot, bullet-like, down the 6 1/2-inch bore barrel, it momentarily fused with the second assembly, creating a super-critical mass, thus initiating a nuclear chain reaction. Only one-and-a-half pounds of the uranium actually underwent nuclear fission, of which a fraction -- a mere fiftieth of an ounce -- was transformed into energy, in accordance with Einstein's famous E = MC². It's the huge value of "c," the speed of light, that leads to so little mass being transformed into so much energy. The "gun method" uranium bomb was only used once. From a military point of view, it was effective because of its simplicity: It was considered almost certain to work and wasn't tested before being dropped on Hiroshima. But its foolproof design also made it unstable, and a crash, short circuit, or fire could have detonated it prematurely. Another drawback was the time required to refine sufficient uranium-235 for a single bomb, as the Iranian government is presently learning. Using two methods of enrichment -- electromagnetic separation and gaseous diffusion -- it took about two years to produce a single bomb's worth of uranium in what was then the largest building in the world, at Oak Ridge, Tenn. The Nagasaki plutonium bomb, code-named "Fat Man," used a trickier "implosion" design that was tested before use, at Alamogordo, New Mexico, in the world's first atomic explosion, the "Trinity" test of July 16, 1945. Since then, plutonium has become the fuel of choice to initiate nuclear fission, and the uranium "gun" design is now a relic of a bygone age ... unless you happen to be a terrorist or a nation wanting to join the global nuclear club. Barry Evans (barryevans9@yahoo.com) marvels that only two atomic bombs have ever been used in warfare, and hopes the U.S. will take the lead for a world without these weapons. He lives in Old Town, Eureka.